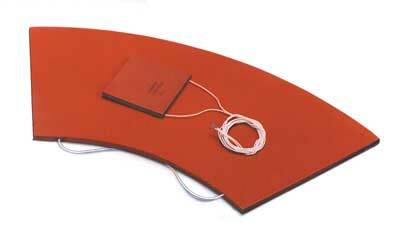 Silicone Rubber Heaters with Insulation. Available in a wide variety of shapes and sizes, these units are typically simple, rugged, economical and resistant to moisture and chemicals. Thin and flexible, they are easily bonded, and may be used in flat positions or wrapped around curved and irregular shapes. Maximum operating temperatures are in the range of 450 degrees F (232 degrees C). Thermostats, thermistors and sensors may be incorporated into their design, and a variety of adhesive or bonding possibilities are available.